Davesh Maulik received his PhD in 2007 from Princeton University under the supervision of Rahul Pandharipande. His mathematical interests include algebraic geometry and its connections with symplectic geometry, mathematical physics, and combinatorics. His research focus is in the area of Gromov-Witten theory and enumerative geometry. 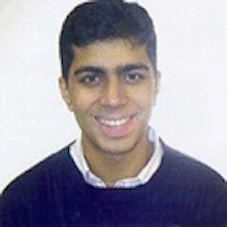 Davesh was appointed as a Clay Research Fellow for a term of five years beginning July 2007.